Combine the flour, caraway seeds, salt, and baking powder in a large mixing bowl. Rub the ghee or butter into the flour. Add enough water to form a fairly firm dough. Knead well for at least 5 minutes, until the dough is smooth and elastic. Then set it aside for a few minutes. Fill the karhai or wok to two-thirds with ghee or vegetable oil and put it over medium heat. While the ghee is heating, roll out the dough into a large square, 1/2 inch (1 centimeter) thick. With a sharp knife, cut the dough into diamonds or rectangles 2 inches (5 centimeters) long. Gently drop half of them into the hot ghee. 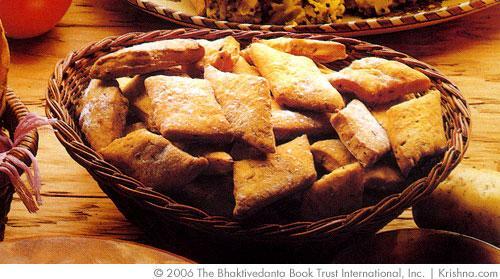 The heat should be adjusted so that the crackers become golden-brown on both sides in 4 or 5 minutes. Remove with a slotted spoon and put in a colander to drain. Then cook the other half the same way.